As you’ll know if you’re interested in this topic (which we’re assuming you are!) then you’ll be aware that there are hundreds of creativity tools out there, and lots of processes to boot. Working out which tools to use for which problem is an art and a science and one that we’re still honing! The key to this is practice and mastering creativity tools on real-world problems and finding those that you can use quickly and easily for yourself and your teams. People have preferences in relation to creativity just like they do with everything else – are you a morning or evening person? A big picture thinking or love the detail? Like a linear path or happy to deviate to find creative solutions? Like groups? Hate them? All of these things will impact on your own, and others creative outputs. In Claire’s book about creativity in business, In Your Creative Element, Claire explores these factors and many more. You can find out a bit more about us and the book here. 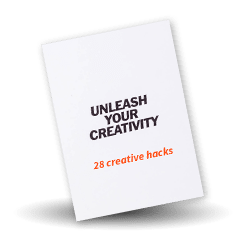 You can also sign up for our newsletter for regular free inspiration and resources below and receive 28 free creative hacks to boot! We have some favourite books on creativity which you’ll find on these pages and also some tools for you to try. Please do get in touch with lucy@nowgocreate.co.uk to find out how we can help you up the ante on creativity in your business.